We’ve all gotten those alerts telling us it’s time to update some of our software. Doing this seems like it should be a no-brainer; after all, the newer version is likely to offer new and improved features that will make the software that much more useful. But alas, we don’t always get around to upgrading our stuff in the most timely manner (my iTunes at home has been asking me for months now). Recently, a coalition of top-tier tech names, Skype, Symantec, and GPS company TomTom, published an infographic looking at why users do, and don’t, go through with software upgrades. The companies surveyed consumers in the US, UK, and Germany to learn more about their software upgrading habits. What they found was that on average, 40 percent of adults usually don’t upgrade their software when they receive a prompt. This number is highest in the US at 42 percent, followed by the UK (41 percent) and then Germany (37 percent). 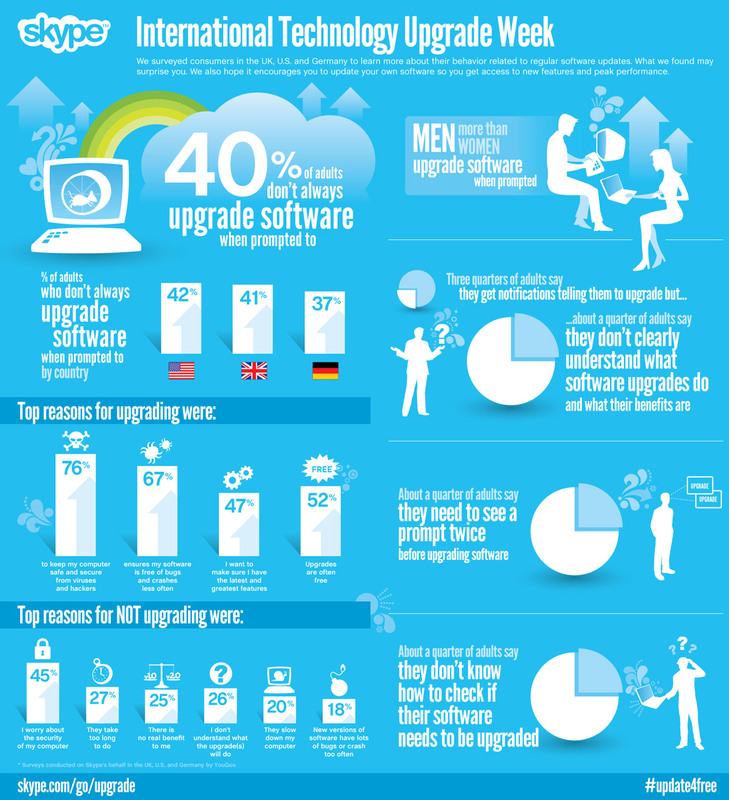 It also seems that men are more likely than women to commit to a software upgrade prompt. For some, this may seem nonsensical, but while three-fourths of the respondents said they had received upgrade notifications in the past, a quarter of them said they don’t “clearly understand” the benefits of upgrading. About 25 percent also said that they need to see a prompt twice before actually doing it, and still one-fourth said they have no idea how to check to see if their software needs to be upgraded on their own. When asked why they decided to upgrade, the primary reason (76 percent) was in order to keep their computer safe and secure, while 67 percent said it was to make sure the software runs more smoothly and crashes less often, 47 percent said they wanted the latest features, and over half (52 percent) did it because it was free. Meanwhile, those who didn’t upgrade were also largely motivated by security concerns, as 45 percent said they were actually more worried about it being a threat to their machine. Other reasons were because it takes too long (27 percent), they see no benefit (25 percent), they don’t understand what it will do (26 percent), they fear it will slow down their computer (20 percent), and they think that new versions tend to be too buggy and crash too often (18 percent). Clearly, the biggest take away here for software providers and users alike is that transparency is important. Users seem to overwhelmingly desire upgrade prompts that present the benefits and explain the purpose of the update, as well as offering reassurance that it will improve, or at least not threaten, the security of their computers. And it always helps if the upgrade is free.